Tips for success in re-building your GFA-565/585 circuit board. Be prepared for a lot of work! It’s more than people expect. But it is very satisfying, like a big puzzle, and the result is a truly spectacular amplifier. This is an advanced electronics project, so if you haven’t had much experience fixing amplifiers, the GFA-565 is absolutely not a good place to start. You’ll need a fairly well-equipped electronics laboratory, with a good soldering station, oscilloscope, signal generator, and preferably a distortion meter. A variac is pretty much essential for powering the amp up the first time. I want as many people to succeed with their repairs, and I am happy to answer questions about the board itself, to clear up any confusion about what parts go where and such, but if you need help actually troubleshooting the amplifier, I need to charge my usual hourly rate. ($60/hr) Please read up as much as you can on the repair of the GFA-565. There are many edifying discussion threads about repairing the GFA-565 at DIYAUDIO.COM. This one and this one in particular. It’s a lot of reading, but you’ll find important tips that may save you time and hassle. the DIYAUDIO community is super helpful, and much of what I’ve learned about the GFA-565 comes from there. It’s very easy to place a component wrong. To prevent errors as I go, I populate the components in roughly the same order as they are listed in the service manual. (But do the surface-mount stabistors first!) For each component, I count out exactly how many of each component I’ll need, and then place them. That way, if I have previously mis-placed a component, I should be left holding an extra component. Here’s the latest board revision! Here’s a spreadsheet with part numbers from Mouser for all known equivalents. Quantities are exactly enough to populate one board. Order extras if you need to match transistors or resistors. You don’t need to replace everything on the board with new parts, but many components are so cheap, you might as well. Resistors listed are all 0.1% tolerance in symmetrical applications, and 1% elsewhere. Dale RN or CMF is my preference, but stocks fluctuate, so TE Connectivity YR1 0.1% series resistors are used where Dales cannot be had. Error in the GFA-565 service manual: In the parts list, the first mention of R114 should read R144. Error in the GFA-585 service manual: Right-Channel output board: Under the heading “Resistors, Oxide Metal-Film. Delete line referring to R204 and R205. These resistors do not exist on the right board, but they do exist on the left board. Reusing original parts: Be cautious about re-using the original components, especially around the high-impedance parts of the input stage. The bad capacitors spray electrolyte all over the board, and a drop of spittle can create a conductive path between component leads, even on the undersides of transistors. Clean between the leads with a sharp cotton swab. All re-used parts should be run through an ultrasonic cleaner. For a solvent, I use a 50/50 mix of denatured alcohol or vodka, and Simple Green. Rinse the parts in water afterwards and dry thoroughly. Your nose can tell you if there is still electrolyte remaining on a component lead. Just heat the component lead with a soldering iron and sniff. The smell is very distinctive; a bit like rotten antifreeze. Once you smell it, you’ll never forget it. To familiarize yourself with the smell, try heating up a component pad around one of the bad caps on the original board. Gross, huh? You can test stabistors with the diode check function on a multimeter. They should read around 1.2v for KB262 and 1.8v for KB362. There should be no reading in reverse. On some earlier versions of the boards, it can be a little hard to tell where pin 1 is on the stabistors. These photos should help. 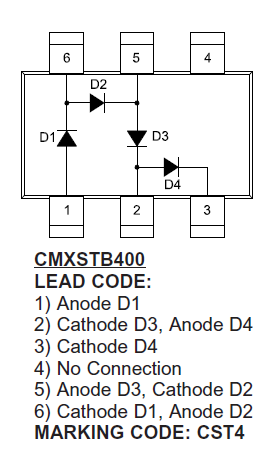 Use the CMXSTB400 to replace both KB262 and KB362. The extra one or two diodes in the chip simply go unused. But you can just re-use the original stabistors if they are good. They are seldom a problem. They are physically fragile, so be careful desoldering. Also, be careful about the markings on the package; they are opposite what you might expect. The KB262 and KB362 diodes that come in the epoxy-blob package—unusually—have a black stripe to mark the ANODE not CATHODE. Don’t take my word on this. Confirm polarity with your meter’s diode test setting. More on this topic here at DIYAUDIO. The original heatsinks run really hot, especially on the GFA-585. I recommend swapping them with the larger ones specified in the parts list. It’s the closest fit I could find, but unfortunately, the transistor mounting hole is higher than on the original heatsink, so the leads on the original transistors wouldn’t reach. Also, the supplied 6-32 screw hole is too large for the TO-126 transistor. You’ll need to drill and tap a new M3/0.5mm hole just below the 6-32 hole. Countersink the hole after tapping. Matching transistors: If you replace the MPSA13 and MPSA63 devices, they must be matched. I recommend it anyways, as the factory matches are only so-so. This is an involved topic, and is covered here at this thread on DIYAUDIO. The DIYAUDIO transistor matching jig is a community effort; The forum moderator ‘Anatech’ designed the circuit, and user ‘Cogeniac’ designed the original circuit board, and I’ve developed my own forked version of that board. At some point there will probably be a group buy for boards. The project will also likely go open-source. Ideally, the cascode transistors Q103, Q104, Q107, Q108 should also be matched. Fairchild KSP42 and KSP92 are confirmed to work beautifully. I sell matched sets of input transistors for $50, or $40 with a board. This is a complete set of 8 matched transistors, enough for one amp. 2x MPSA13, 2x MPSA63, 2x KSP42, 2x KSP92. Original transistors 2SC3478/2SA1376 and 2SC1815/2SA1015 have ECB pin-outs. (Left to right, looking at face of transistor.) Replacement transistors KSP42/KSP92 are EBC, and BC550/BC560 are CBE instead of ECB. This causes some confusion! If your GFA-565 board revision is earlier than v2018.09.26: You must bend the transistor leads bent goofy in order to fit the original ECB pads. This can be surprisingly difficult to keep straight. Triple-check that you have them in the correct order. The way to be sure of your Es and Bs and Cs, is to use a transistor tester to verify the leads are in the right order. I use the one built into a cheap multimeter. It’s not a good transistor tester, but when the leads are in the correct order, you will read a gain over 100. Compare to the original transistor outline and install. If your GFA-565 board revision is v2018.09.26 or later: Much easier! The transistor pads have an extra emitter pad, accomodating either transistor pinout. Align the face of the transistor with the flat printed outline. Extra Diodes: New versions of the boards, v2018.09.26 and up, have two extra diodes, D120 and D121, 1N4148. These are reverse-protection diodes around Q113 and Q114. These diodes are not in the original GFA-565 design, but they do exist in the GFA-585, which came out after the 565, so I reckon they were added for a good reason. I like to get rid of the wire-wrapping posts and solder the wires directly to the pads. When I put the amp back together, I install the output modules last, so no need for the wire-wrapping posts. It’s a good idea to refurbish the soft-start board while you’re at it. The original 25W 4.7R in-rush protection wire-wound resistor often burns out. I replace it with an aluminum-cased 50W resistor. IMPORTANT: The original resistor is held in place mechanically as well as by solder. In the event of a melt-down, it should not collapse and short to the chassis. The replacement resistor should be mounted in such a way that it will not fall through or collapse if it melts. I use 12ga solid copper wire arranged as in photo below. You could also mount it to the chassis and run short wires to it. Also recommended is to replace R501 3.3K with a higher-wattage 1/2w resistor. The original runs hot enough to turn brown. Don’t forget to short out the 4.7R soft-start resistor if you are bringing the amp up on a variac. If you don’t have a variac, at least use a DBT. (Dim bulb tester) But I really, really recommend using a variac. Speaking of variac testing, the amp’s bias circuit will not engage and un-mute the amp until you hit about 40VAC input. If you replace the 2SC3298/1306 TO-220 drivers with On Semi MJE15032/33, you may have an oscillation issue, which is solved by also replacing the 2SC3907/1516 that forms the second stage of the darlington, with On Semi NJW1302/3281. I do recommend replacing these as a matter of course, as the breakdown voltage headroom is improved. The output zobel network’s resistor and capacitor can be mounted directly to the binding posts instead of on the input board. I think this is much better than the ten inches of wire used to run it back to the input board as original. There’s no reason for it to be on the board; it connects to nothing there. Part numbers for a nice polypropylene cap and non-inductive resistor are in the spreadsheet. Wire Jumpers: Don’t forget to install a jumper from points B on the 565 board, and points D on the 585 boards. Use a 14 or 12ga wire. You’ll notice there is no need for the smaller ground wire jumper labeled “a” as in the original board. This wire has been turned into a trace on the top layer. I recommend testing the board before you hook up the output section, and risk blowing out twenty expensive output transistors. The best way to test the board is outside of the amp, hooked up to a lab power supply. Override the bias delay: The bias delay consists of an opto-coupler and switching transistor located on the power supply relay board, whose job it is to turn on the amp’s bias circuit after a short delay, in order to mute the amp while it powers up and stabilizes. This is the purpose of the long wire that goes from the power supply board to J106 on the input board. We’ll simply bypass all that. All that’s required is a jumper from the center pin of J106 to point 17, and that will energize the current source circuit. GFA-585 Right Board: Unfortunately, the voltage divider that energizes the bias circuitry, only exists on the left board. No problem, just connect two 39K metal-oxide resistors in series, tie one end to B+, the other to ground, and tie the middle point of this divider to the center pin of J157. The thermal protect LED does not need to be connected. It doesn’t hurt though. Connect an LED to test the clip light functionality. Output and feedback hack: Solder a pair of standard 1/4W 1K resistors into points 3 and 4 and tie them together on the other end. (Y-Connection) This is your output. From there, run a short wire to the feedback input at point 7. GFA-585: Drive signals are on J105 and J155. Feedback goes to points 13 and 8, left and right boards respectively. Configure your lab power supply as a +/-30V bi-polar supply with a common ground. +/-30V is plenty to operate the circuit. If your power supply allows you to slowly ramp up voltage, that’s a good idea. Connect your scope to the Y-point of the two 1K resistors you’ve hung off the drive outputs. Powering up: Set your signal generator at 1KHz, 100mVrms. Power up, and hope that none of the magic smoke escapes. If you’ve got it right, you’ll be looking at a nice clean sine wave on the scope. Distortion may be higher than the final amp, but it should be less than 0.1%. You shouldn’t see any wave deformation on the scope. DC offset should be less than 20mV. If the board seems to be working well, try a higher supply voltage, up to the full operating voltage of +/-85V, if your supply goes that high. Don’t get shocked! Check the voltage on pin 6, the output of the DC servo op-amp. If the amp were theoretically perfectly balanced, you would read 0V here. A good amp will read up to +/-4V. If you read something close to 14V, positive or negative, that means the servo is trying as hard as it can to correct some DC imbalance, and that means something is wrong. Check DC Operating points: Download this spreadsheet, which I use to check each board I assemble. It contains DC operating points as well as a other parameters you can check. Bask in the glow of the LEDs and your accomplishment. I suggest testing each and every component on the output modules before re-assembling the amp. If you check the output transistors with your meter set to diode test, they will read a short. Lift one leg of the 68R and 7R5 resistors on the output modules, and you’ll be able to test them. If all seems well, you can assemble the rest of the amp with some confidence. Good luck! Please let me know if you have any suggestions or corrections to this documentation.